Sapa is the gateway to North West Vietnam with dramatic scenery, plenty of accommodation, cafes, pizza bars and souvenir shops. But if you’re more interested in the less touristy side of the highland region, head to the small town of Bac Ha, an ideal location for remote treks and colourful weekly markets. Two hours by car from Lao Cai Train Station, Bac Ha is 700m above sea level and home to about 70,000 people. 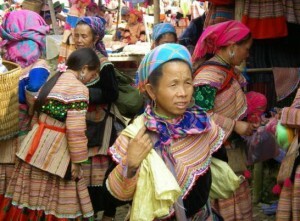 In the surrounding highlands there are 10 ethnic groups that live in the area including the colourful Flower H’mong, the Dzao, Xa Fang, Nung, Thai and Thulao. 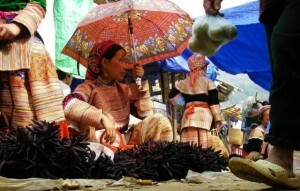 One of Bac Ha’s main industry is the manufacture of home brew. The locals have made an art form of distilling rice wine, cassava wine and corn liquor – a word of warning, the hooch can be so potent it can ignite and result in embarrassing dance movements – I know this from experience. Tourism is still in its infancy in Bac Ha and during the week the town has a deserted feel. 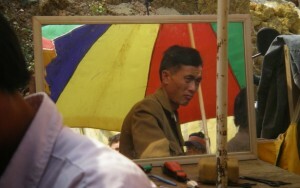 But on Sunday morning, the town moves into overdrive when visitors flood in to mingle with the Flower H’mong selling their wares and socialising at the weekly morning markets. The Flower H’mong travel overnight from their villages to Bac Ha to sell clothing, handicrafts, textiles, shoes and the local hooch. You can also buy water buffalo, pigs, horses, dogs, chickens and native animals that probably should not be for trading due to international laws. The market day is also a party for the H’mong men who group together to swap stories and get pickled on hooch, they also love dragging in the odd tourist into their gathering. Twenty kilometres up the road and only 9km from the Chinese border is Can Cau, home to one of the largest open air markets in the region specialising in live stock. The markets attract a large number of Chinese traders who look like they’re interested in the dog and exotic animal trade. The market is well worth a visit and is only open on Saturday morning which makes for a perfect itinerary as you can overnight in Bac Ha on Saturday night and get up early before the hoards of visitors arrive to catch the Sunday Bac Ha Markets. Bac Ha is a convenient place to explore the surrounding villages and see how the ethnic communities live. There are less touristy trekking and home stay trips available in the area where conditions are basic but the hospitality is generous and makes for a memorable experience. For day trecks you can visit Ban Pho village which is about a 7km return trip or Na Ang a 6km return walk and Na Hoi is a 4km return walk. Make sure you’ve sorted out your finance before arriving as there are no banking facilities for tourists in Bac Ha. There is a post office and internet is available at some of the hotels and internet cafes (which are usually packed with teenagers playing games). Bac Ha is not a good place to handle travel logistics, so make sure you have all your ducks in order before arriving.